We've all been aware of the continued partnership between Samsung and Google with regard to the birth of the third Googlephone, following on from the Samsung Nexus S, for some time now. The Nexus Prime or Galaxy Nexus as it has more recently been known, was set to take center-stage alongside the official launch of Android 4.0 Ice Cream Sandwich, the latest edition of Google's mobile OS. Unfortunatley, we encountered a slight snag as the Unpacked event at the CTIA conference in San Diego, intended to pose at the platform for the October 11th annoucement, was cancelled by Samsung, apparently out of respect after the death of Apple co-founder and former CEO Steve Jobs. So with the event now turning its back on us, we were left wondering when Google's next 'chosen device' would officially get to show its face. After rumors and speculation we received the word; October 19th was to be the new date. The date itself, we heard about through the grape vine back on Wednesday, but now, we have reports of official invites courtesy of Samsung, having been issued as of this Thursday. The new event will take place on October 19th (as we said), with doors opening at 9:30am and the event kicking off at 10am. 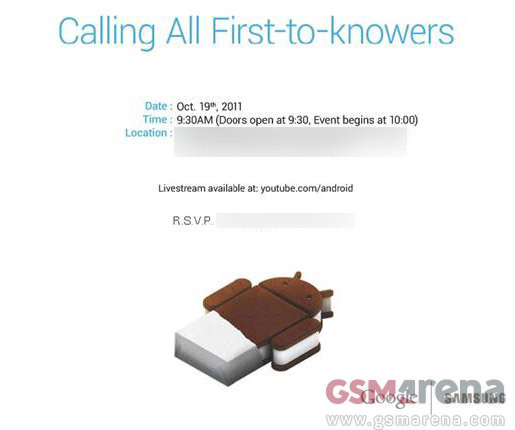 You'll be able to watch a live-stream, assuming it fits in with your timezone, via youtube.com/android, meaning by the end of play on the 19th we should finally have the full story on both the next Nexus and Ice Cream Sandwich. With a sigh of relief, we can't wait.